Andrew Robertson was born in Kenya on 25th March, 1957. His parents were Scottish and his father was a farm manager. Andy became a Physical Training Instructor with the Army and by 1979 was based at Harrogate where he managed to increase his marathon training considerably. For the next five years he competed at a very good International level and his fastest marathon (2:14:23) is still ranked at thirteenth in the Scottish All-Time list. Passing 10 miles in 50:31 Robertson was well over 100 metres clear of the rest and at around 12 miles his lead was 34 seconds. A tall, lean 60 kg, with a hollow, unshaven face, Robertson gave the impression of a man ready to run away from the rest or die in the attempt. Behind him the bunch kept together and it still seemed probable that the gaunt leader would be reeled in later on, especially as Robertson was by-passing all the drinks stations which seemed to invite dehydration”. Jim Dingwall was forced out of the race with muscle trouble before halfway. Robertson pulled further away and passed 15 miles in 1:15:18. By 18 miles his lead was well over a minute. The chasing group was down to four: Colton, Cain, Laing and Ray. At 21 miles Colton was suddenly gripped by cramp in the calves and had to ease off although he still felt strong. Cain pushed on alone and cut into the lead significantly, sure that Robertson would suddenly fold up. “Meanwhile, what of Robertson himself? Was he thinking he had gone too soon? ‘It did cross my mind more than once or twice, but once you are committed it has to be eyeballs out all the way. I hadn’t a clue how far ahead I was because spectators were calling out anything between 100 and 180 yards. I was trying to stay relaxed, particularly up to 20 miles, then I pushed it again over the last five or six. I knew they would close on me but I didn’t mind how much as long as I was still in front at the end.” As he finally turned off the road into the Sandbach Leisure Centre for the approach to the finish, Robertson had little more than 100 metres of his lead left as Cain charged after him. But it was enough as he crossed the line 15 seconds ahead in 2:14:23, a personal best by almost three minutes. Cain knocked 20 seconds off his own best with 2:14:38, while the freshest finisher of the day, Terry Colton, still sliced four minutes off his best with 2:25:11. * Graham Laing in 2:15:29; * Ian Ray in 2:15:58; *Trevor Wright in 2:16:58; * Dave Clark in 2:18:42; *John Robertshaw in 2:18:56; Colin Taylor in 2:19:09; Des Austin in 2:19:21. On 2nd August, 1981, Andy Robertson wore the Scottish vest with pride in a track international at Meadowbank versus Denmark and Eire, finishing a solid fourth in the 10000 metres (30:24.61) in front of an Irishman and a Dane. 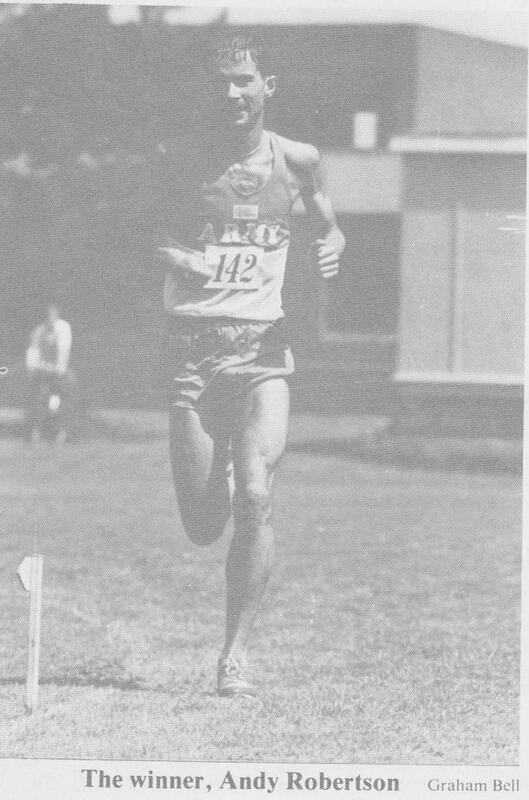 Andy was rumoured to have Stirling connections, and by now he ran not only for the Army but also for Spango Valley AC, although not apparently in any major Scottish team events such as the Edinburgh to Glasgow Relay, the Road Relay or the National Championships. Sadly Andy Robertson struggled on 13th September because of an Achilles tendon injury. Competing for Britain as he had hopes in the European Marathon Cup, he as ninth at 25km but ended up fifty first (and fourth Briton) in 2:27:01. His team finished seventh. From the nineteen nations fielding teams, there were 81 finishers, but many dropped out due mainly to temperatures in the seventies and high humidity. 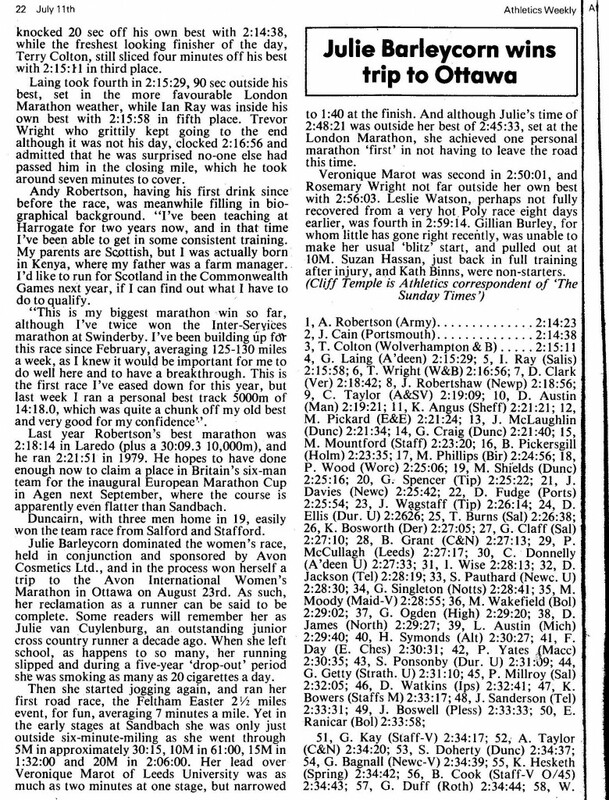 On 31st January, 1982, Andy Robertson repeated his second position in the Bermuda Marathon. This time he was timed at 2:18:11 behind the very experienced Coventry Godiva Harrier, Colin Kirkham (2:17:28). Andy followed this on 10th April with third place (2:17:05) over another very fast course in the Westland Marathon at Maasluis, Holland. Strangely, Andy did not compete in the AAA’s Marathon which was the Commonwealth Games trial on 13th June when Scots (John Graham, Jim Dingwall and Graham Laing) came fourth, fifth and sixth, all in 2:15+. The result was that John Graham and Graham Laing were chosen for Brisbane and ran very well in October over a very testing, hilly course to finish fourth and seventh in the Games. By then Andy had gained some consolation on 26th September by winning the Torbay Marathon in 2:18:21. 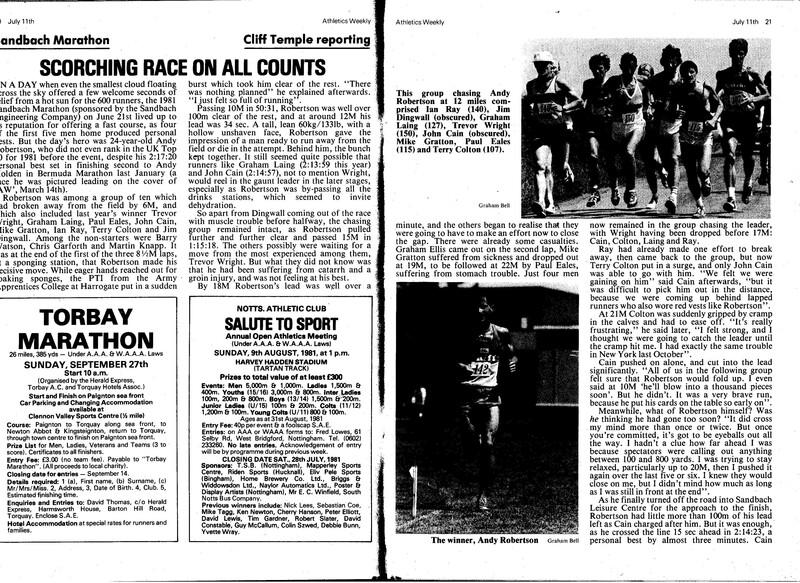 His good form continued on 30th January, 1983, when at the third attempt, he fully deserved his victory (2:19:09) in the Bermuda International Marathon. Then in 1984 he recorded yet another excellent time (2:15:23) in the London Marathon. There is no mention of Andy Robertson in the 1985 rankings. His career may have been short but indicates boldness, strength, speed and consistency at an impressive level which would certainly have qualified him to compete with distinction for Scotland in most Commonwealth Games.